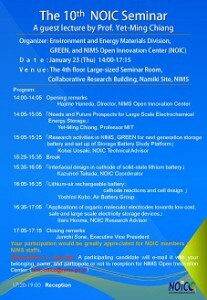 On Thursday, January 23, 2014, having Prof. Yet-Ming Chiang of MIT as a guest lecture, NIMS will held the 10th NIMS Open Innovation Center Seminar at Namiki site, NIMS, Japan. Abstract: Click here for abstract . Click the below for the program.